River Givers is the new fundraising scheme launched by West Cumbria Rivers Trust and is a great way to get involved and contribute to the upkeep, protection and improvement of West Cumbria’s lakes and rivers. There are various levels of donations that can be pledged for the scheme and the benefits of becoming a River Giver are: five trees planted every year of membership, a membership card, our regular WCRT newsletter posted to your door, a car sticker, priority invitations to West Cumbria Rivers Trust events and a site visit upon request. The money donated through the River Givers Membership Scheme will be spent on river improvement projects, some of which include improving resilience to flooding. 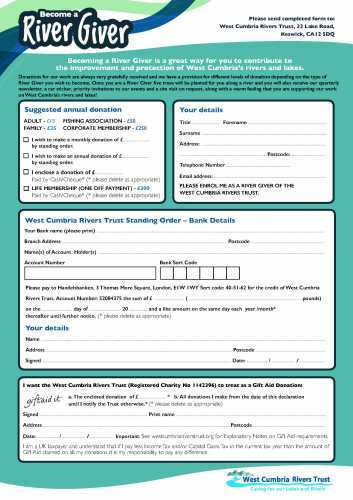 Donations for the work West Cumbria Rivers Trust undertakes is always gratefully received. This is a one-time procedure, your information is protected and we strictly adhere to the Data Protection Act.